Our organization occupies the leading position in the field of designing a wide range of Low Intensity Aviation Light. 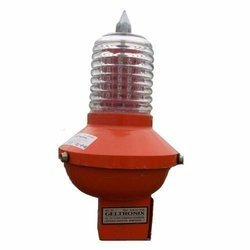 The bodies of these warning lights are made up of excellent quality aluminium ensuring its durability and fire retardation property. It is designed with optical illumination, which is capable of providing 360 degree Illumination with the help of high intensity Red LEDS. These lights consume reduced power supply for its optimum operation. •Withstands impact of up to 5J. Looking for Low Intensity Aviation Light ?